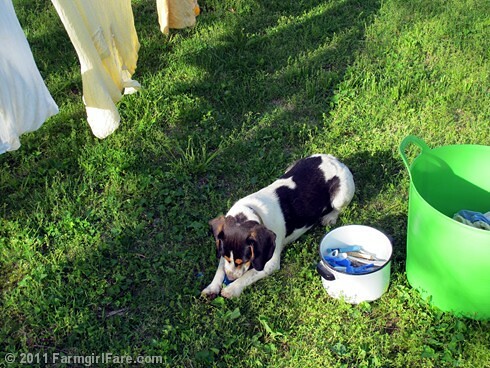 Do you love laundry lines, too? 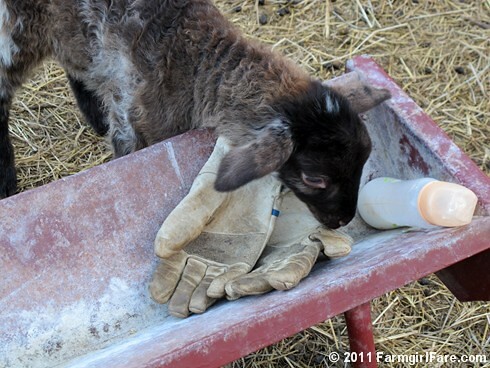 © FarmgirlFare.com, where you turn your back for a minute and somebody's munching on plastic. 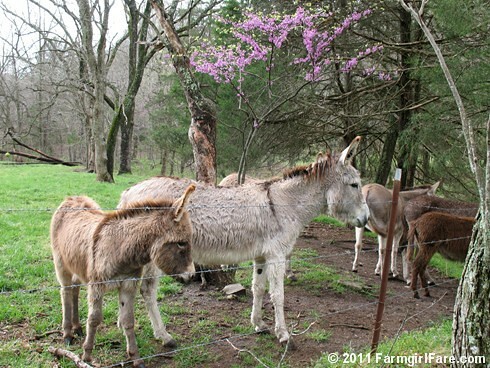 Thanks so much for your thoughts and prayers regarding our overflowing creek and flooding farm. 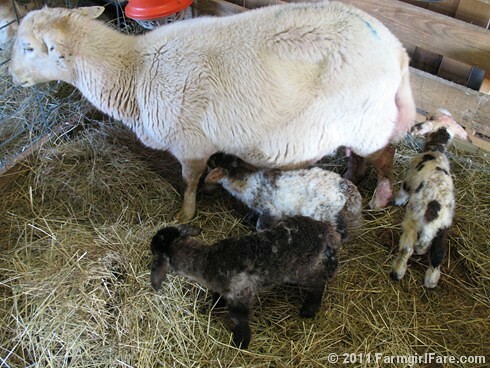 The short version is that everyone in the farmyard and barnyard is doing okay, including the new baby lamb. More below. 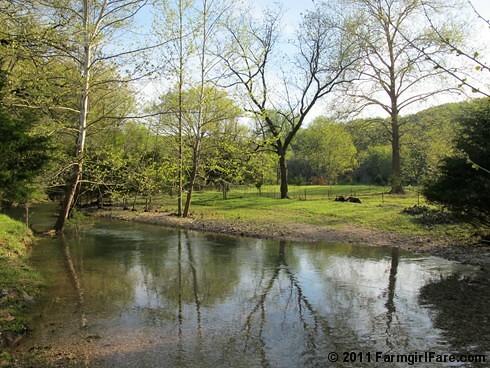 . .
Monday Farm Photos: Creek's Up. Way Up. 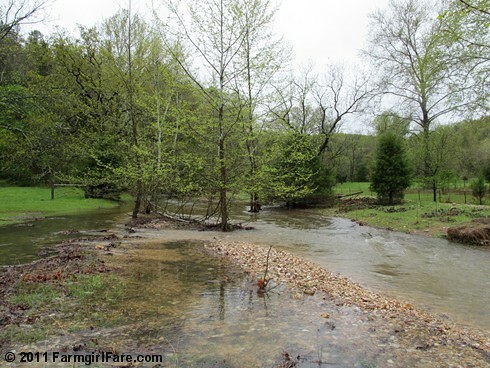 For at least 11 months out of most years, our wet weather creek bed, which meanders for about a mile through the farm, is filled with nothing more than ten million rocks and my wishes that our peaceful and useful (no hauling water for the sheep!) little babbling brook would run all the time—especially during the heat of summer. After we've had a lot of rain or snow, the creek will start to run, first upstream next to Donkeyland, then down past The Shack, and finally alongside the entire length of the hayfield before it leaves the property. The water comes off the hillsides and from underground wet weather seep springs. Sometimes it takes several days for the creek to make it down to The Shack, and sometimes it dries back up before it reaches us. Sunday Dose of Cute: No Sign of the Easter Bunny. . .
Sunday Dose of Color: Happy Easter! 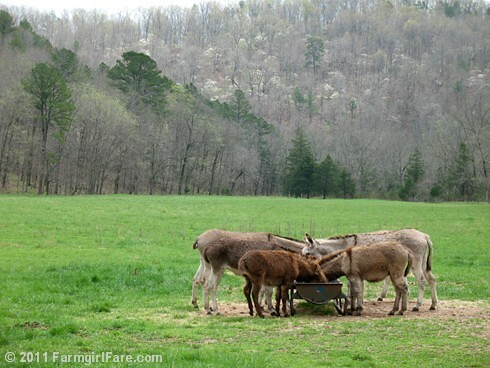 © FarmgirlFare.com, the raining like crazy (four inches so far, with storms predicted through Wednesday—can you say closed highways and flash flood warnings everywhere?) 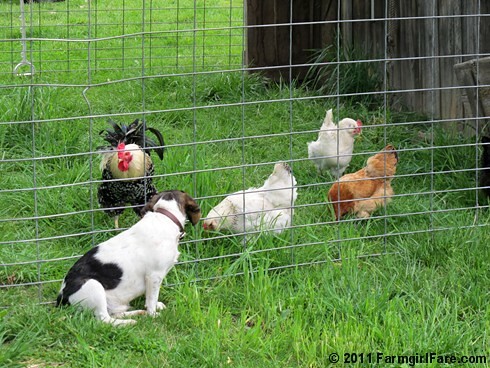 foodie farm blog where we finally found Cheeky and Tuffy's (our two free ranging hens) eggs. Turns out they were hiding them for Easter. Saturday Night Dose of Cute: I'm Not the Only One. 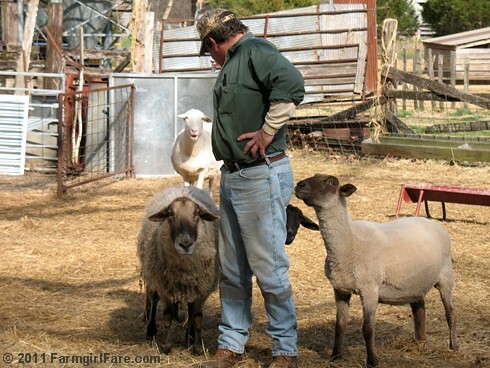 . .
Who loves my hunky farmguy. Want to see more of this loveable man? You'll find lots more photos here and here. 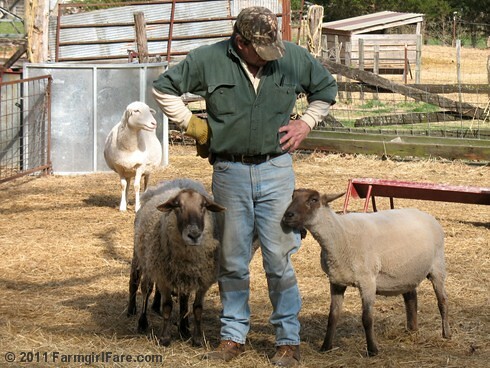 © FarmgirlFare.com, where hunky farmguys need to maintain their manly image, so don't tell Joe I posted these cuddly photos of him! 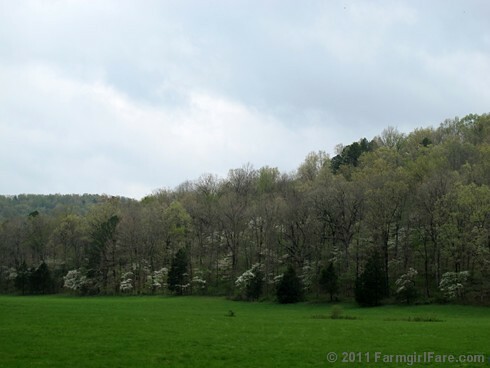 We've never had this many dogwood trees bloom before. They're gorgeous. 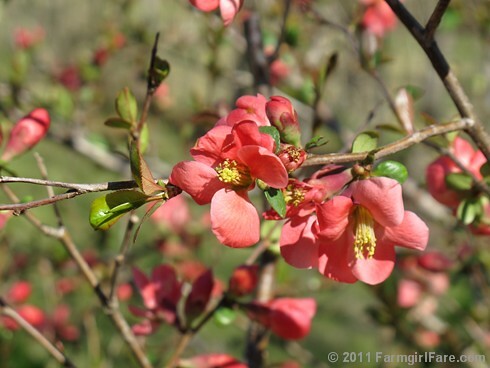 © FarmgirlFare.com, leafing out and loving these gorgeous spring days—almost as much as the rain that's falling right now and watering our growing fields. Now if only the storm hadn't just knocked out the satellite Internet connection. Being adorable can really tire you out. 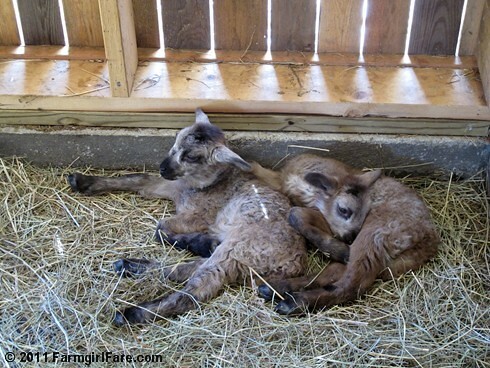 © FarmgirlFare.com, where the lamb count has held steady at 30 since Monday and it's supposed to thunder and storm all night—which has me thinking there's probably going to be some late night (as in middle of the night) lambie action in the barn. 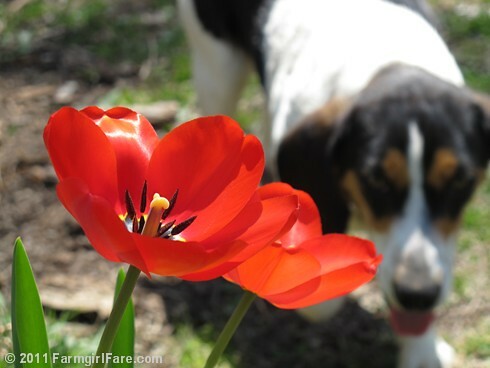 © FarmgirlFare.com, where the pinkest nose always knows. 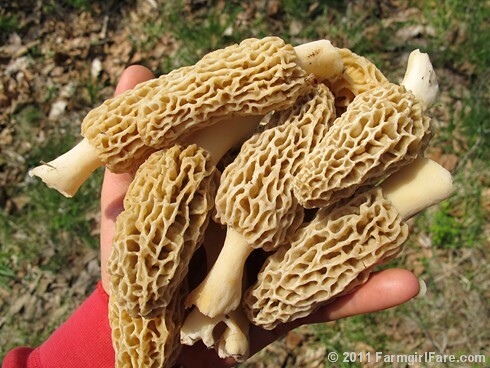 Oh, morels! Talk about the perfect star of an Earth Dinner. These farm foraged morels* tasted divine, sautéed in organic butter just a few hours after finding them on Sunday and sopped up with a warm and crusty hunk of freshly baked baguette (a simple new yeasted beer bread recipe I've been working on—and may have finally perfected!). 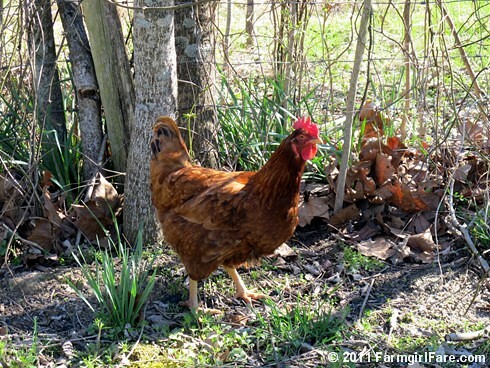 © FarmgirlFare.com, the thrilled with this foraging find foodie farm blog where it happens to be turkey hunting season this week, too, but we prefer to admire our wild turkeys from a distance, rather than spend the day dressed head to toe in camo trying to outsmart them. Deer season, however, is a different story. I love venison, though thankfully the donkey peddling cowboy (who is also the one responsible for bringing Bert and Bear into our lives) usually shoots one for me. 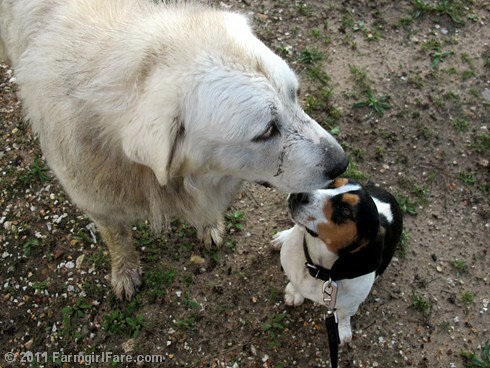 Tuesday Dose of Cute: No Need to Call the Fire Dept. Smudge has his own ladder (and he knows how to use it). Want to see more of this fluffy, fourteen year old fellow? 10/20/10: Anybody Up for Raking Leaves? 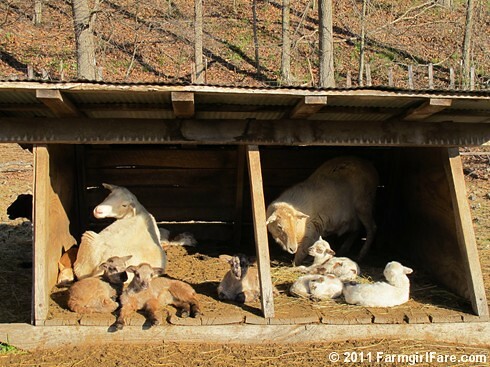 © FarmgirlFare.com, where everybody at the barn is quiet until you get all the way back up to The Shack—and then somebody starts wildly baaing their head off for their mama or their baby. And if you hear it, you can't just ignore it—or at least I can't. Gotta go. Happy Earth Week! A perfect way to celebrate it is by attending or hosting an Earth Dinner. Chefs Collaborative is a national nonprofit network of chefs and farmers that fosters a sustainable food system using the power of education, collaboration, and responsible buying decisions. This year, Chefs Collaborative and 65 restaurants are partnering with Organic Valley to bring Earth Dinners, a series to raise awareness about local, sustainable, and organic food to the dining public. 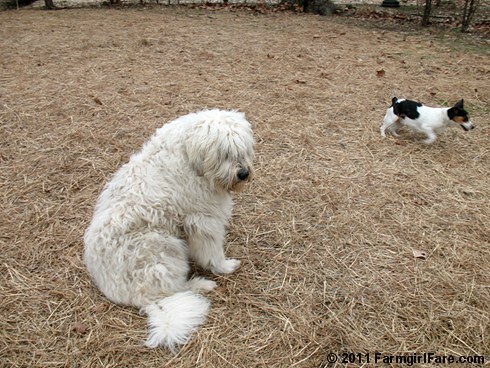 © FarmgirlFare.com, where some of us simply cannot stay clean—and never met a mud puddle we didn't like. Want to see more of this big new baby girl? You'll find lots more photos of her here. And you can catch up with what's been going on during this fast and furious (28 babies born since April 1st!) 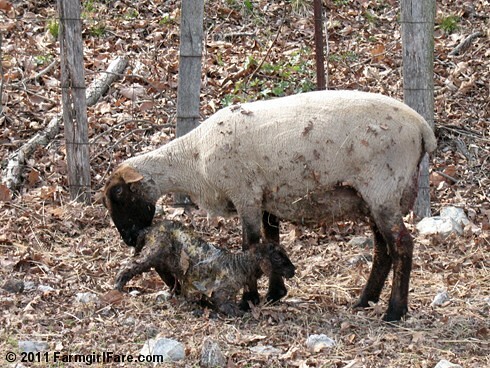 lambing season here. The Daily Donkey 69: Anonymous Dan—Hiding or Eating? Thursday Dose of Cute: One Very Big (and Awfully Adorable) Baby Girl Born Today! 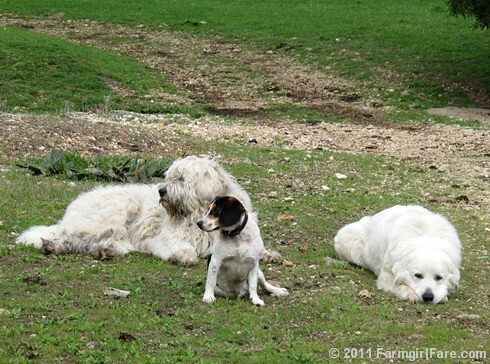 Tuesday Dose of Cute: Three Times Two, Woohoophew! We've had three sets of twins born in less than 24 hours, plus a big (slightly stuck) single boy born yesterday afternoon. 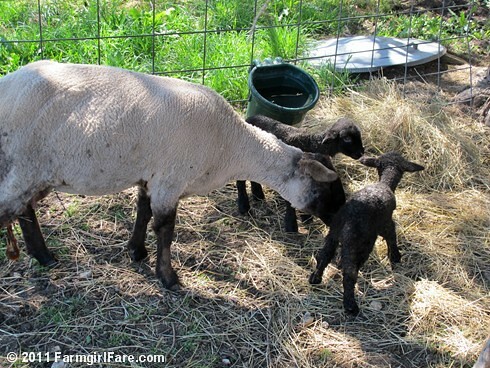 © FarmgirlFare.com, where it isn't all about the baby lambs this time of year—just almost all. I love it when the dogs crash a photo shoot. © FarmgirlFare.com, where plans inevitably get changed when the power suddenly goes off (which also means the water goes off) for the afternoon. What can you do without those two? Play Work on the tractor, sweep the floor, weed the garden, or have a baby! 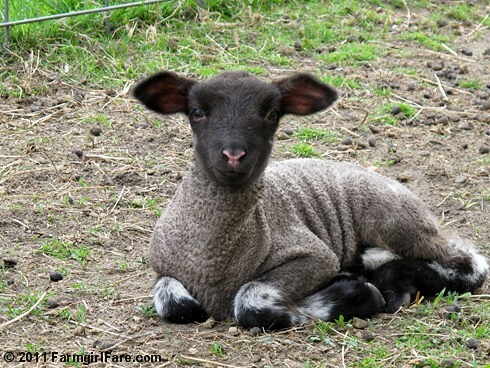 Current lamb count: 17. These are the triplets Clare Elizabeth had at about 2am last Sunday. I arrived at the barn while she was cleaning up the second one. That polka dotted cutie pie with the big pink nose (who Joe says is trouble with a capital T) was born last. They're about 5 hours old here. Friday Night Dose of Cute: Back in the Baby Business! 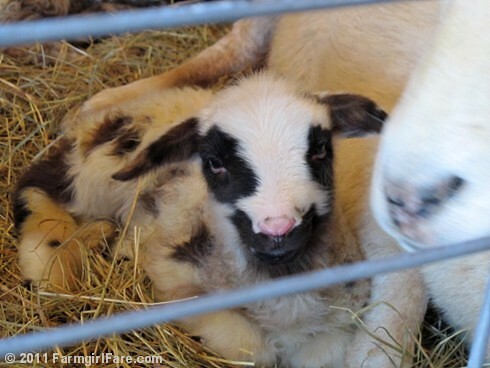 Nine more photos and a lamb report below. . .
Thursday Dose of Cute: Waiting. 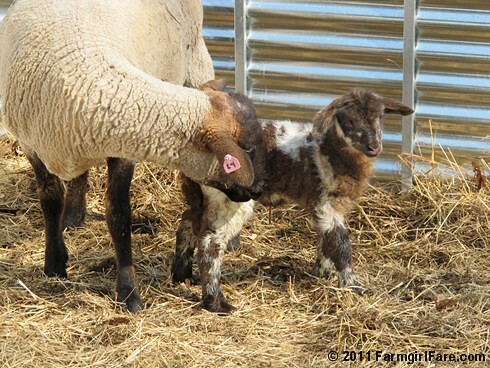 . .
Current Lamb Count: still 9. 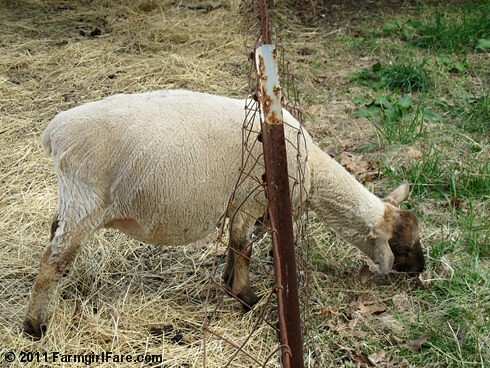 Number of pregnant ewes remaining: 16. Number of hours since the last new arrivals: 66! Number of trips I've made down to the barn during that time: probably about 18. In those 66 hours, we've had a heatwave (72° at 3am), a thunderstorm, temps in the 20s, one of the most blustery days ever, a new moon, and a 6 hour trip to town. I was sure with all that going on there would be babies popping out everywhere! © FarmgirlFare.com, pink nosed, polka dotted, and having a feeling it's probably going to be a busy night. You should see them romping together. 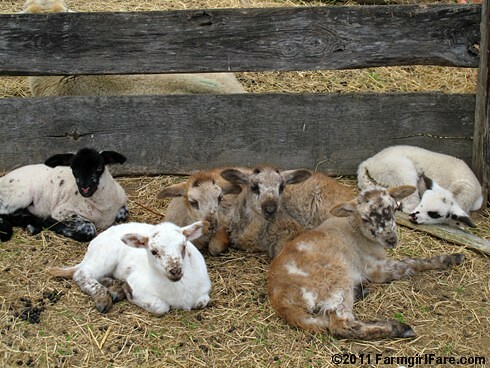 © FarmgirlFare.com, where it's back to the barn to snuggle some baby lambs check on everybody and tell all the pregos to please cross their legs until we get back from town! Estelle and her brand new baby boy, a little before 5:00 yesterday afternoon. 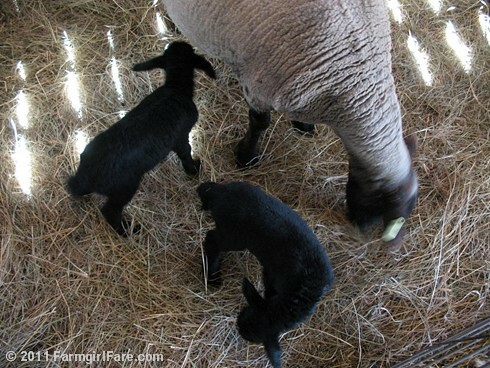 BB (short for Black Beauty) and her twin boy and girl, born about 1:30 this morning. 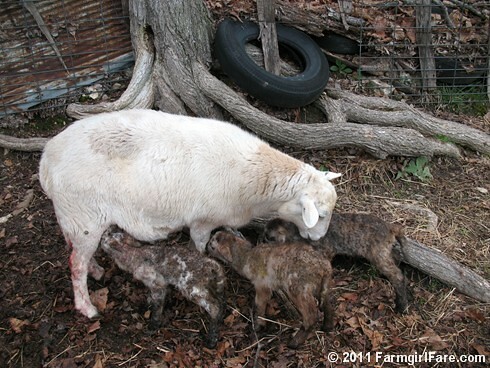 Current lamb count: 6. Sets of triplets: 1. Sets of twins: 1. Girls: 3. Boys: 3. Number of BB's babies who refuse to get with the nursing program (like, at all): 2! Number of hours I slept last night: 3 (from 11pm - 2am). 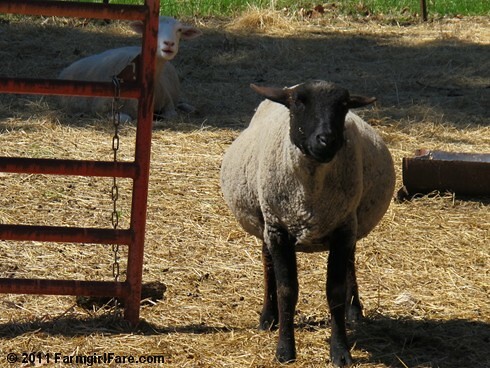 Number of pregnant ewes remaning: 17. Spaces currently available at the Bonding Suite Inn: 2 (with two more under construction). Lots more photos after the jump. . .